Joint recall with Health Canada, the United States Consumer Product Safety Commission (US CPSC) and TJX Canada. 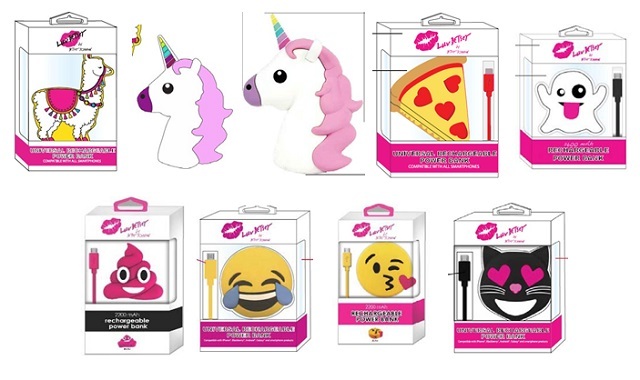 This recall involves Luv Betsey Universal Rechargeable Power Banks which come in a variety of colours and shapes, including a unicorn head, a cake, and emojis. The power banks contain lithium ion batteries and are compatible with smartphones and tablets. The UPC code is located on an adhesive price ticket that was applied to the reverse side of the packaging. As of February 25, 2019, the company has received no reports of the power banks overheating in Canada, and no reports of injuries. In the United States, the company has received 3 reports of the power banks overheating, and no reports of injuries. Approximately 6,955 units of the affected products were sold in Canada and approximately 159,419 were sold in the United States. The affected products were sold from October 2016 to June 2017. A Division of Steven Madden, Ltd.
Consumers should immediately stop using the product and return the product to any Winners, Marshalls or HomeSense store for a full refund. For more information, consumers may contact TJX Canada by telephone toll-free at 1-800-646-9466 between 9:00 a.m. and 5:00 p.m. EST, Monday through Friday. Consumers may view the release by the US CPSC on the Commission's website .